Jess is a beautiful 8-year-old black cat who came into the surgery because she had lost her appetite. Her teeth were in need of attention and she was also vomiting. Despite appropriate medication Jess continued to be sick so blood tests were carried out, and she was medicated by injection as well as receiving intravenous fluids. The blood tests suggested liver involvement but were not 100% conclusive. We therefore next carried out an ultrasound scan of Jess’ liver and placed an oesophagostomy feeding tube, as Jess was still not eating and would not tolerate syringe feeding. Her teeth were also cleaned and polished. Oesophagostomy tubes are a type of feeding tube that passes through the side of the neck directly into the oesophagus (gullet). They are held in place with sutures and the area is bandaged for patient comfort. They are usually tolerated very well and can remain in place for months without any problems. The daily food requirement for the patient is worked out and fed in regular small amounts. The food we use is highly calorific and liquidised. If the tube gets blocked then we use coke to unblock it! The bandage is changed twice daily and the surgical wound site is cleaned at the same time. Our scan showed Jess’ liver to be abnormal and mottled. An exploratory laporotomy was carried out and biopsies were taken to give us more information about her condition. As Jess recovered from her anaesthetic she developed a pneumothorax which is when air enters the chest cavity and deflates the lungs. She was placed in an oxygen tent and treated appropriately until it had resolved. This is a very rare and unusual occurrence that we felt related to an anatomical abnormality in her chest and not the surgery. Jess recovered well from surgery and was sent home with her tube in place. She gradually started to eat more and more and brightened up. The biopsy results showed no sign of a tumour, and it was supposed that Jess had suffered inflammatory bowel disease or a localised peritonitis with some liver involvement. Jess’ feeding tube was removed after being in place for just under four weeks. All medication was discontinued and she was put on a prescription diet. Luckily Jess was insured so we were able to provide the very best possible care for her in what turned out to be a long and very complex case. We are thrilled that Jess is now a happy bright cat who is eating normally again. Did you know that hundreds of pets go missing every day as a result of straying, theft or following an injury or accident. Sadly many pets are never reunited with their owners for one simple reason – they cannot be reliably identified. The compulsory mirochipping of dogs from 2016 is long overdue but why wait till then? While collars and tags can get caught or removed, the good news is that you can permanently identify your pet with a microchip. 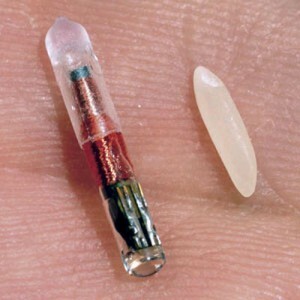 Microchipping takes just a few seconds, with a tiny implant only slightly bigger than a grain of rice. 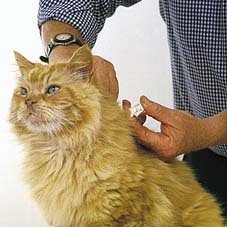 Like a normal injection, it is inserted under the skin at the back of the neck and, once there, lasts a lifetime. 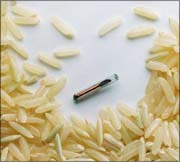 The chip contains a unique code that identifies the pet and the owner. These details, including your name, address and contact phone numbers are held on a central database. 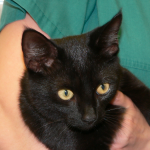 Veterinary practices, the police and animal charities have microchip scanners and routinely scan strays. Should your pet go missing and be handed in as a stray, if they are microchipped, this will give you the best chance of them being reliably identified and returned to you. Do also remember that if you move house or change your phone number it is vital to update the central database! So, don’t take any chances – make sure your pets are microchipped and give them the very best chance of being returned if they go missing!